Angela Edge has been creating music for most of her life. Her eccentric musical journey started when her father put a bass in her hands at the age of 14. She instantly became enamored with this new four stringed instrument. Teaching herself to play on the stage of her father’s hometown Pentecostal church, she learned by watching and listening to other bass players. She molded her own concept of bass, melody, and harmonic style. With that, the Angela Edge bass technique was born. Already a trumpet player since the age of 12, she continued her musical studies throughout her teen years. Her study earned Edge a scholarship to the University of Arkansas, majoring in music education for trumpet. Once in college, Edge began playing locally around Fayetteville, AR with a classic rock cover band named Uncle Woody. Through new Fayetteville contacts, Edge soon met Jori Costello, with whom she made an instant musical bond. Edge left Uncle Woody to join the Jori Costello Band. This transition allowed her to expand on, and develop her style. Playing in coffee shops and local events were soon not enough for Edge, who was ready to tour internationally. The Jori Costello Band was contracted for 5 weeks for a tour with a national folk artist. This afforded Edge the opportunity to play with musicians such as; Cris Williamson and Peter Yarrow. Angela Edge also played at festivals that featured musicians such as; Les Claypool, Michael Franti, Melissa Ferrick, and Alix Olson. 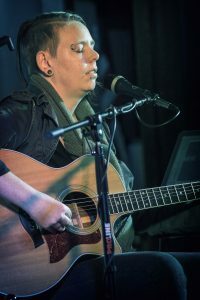 She has played at Washington DC PRIDE, San Francisco Pride, High Sierra Music Festival, The Folk Alliance in Montreal, and the Kerville Folk Festival. Edge also played at The Blue Bird in Nashville and The Bitter End in NYC. Thus, her music has evolved over the years from the days of playing in coffee shops and local venues. 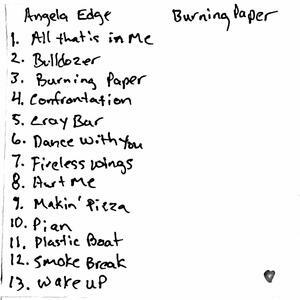 Angela Edge has found her own unique voice with potent Lyrics and sweet melodies, creating music that even the most studied poet would love to analyze.